Personally meeting an artist is always a special event. But meeting one of the most talented mosaic artists in the world today is even more special. A week ago I was invited to the Palos Verdes Peninsula to the home of Mr. and Mrs. Leo and Merrietta Fong where I had the privilege of meeting Mr. Enzo Aiello. The Fongs graciously opened their beautiful home to share their latest piece, the “Getsemani” project by Italian mosaic artist Mr. Enzo Aiello. The moment I walked through the door, the large triptych (with three parts) on the living room wall immediately caught my attention and took my breath away. Making my way past the people admiring this amazing work, I could see tiny bits of gold mosaic glistening in the light as I approached the salmon-colored marble. The single rose in the first panel seemed to be holding tight and the second panel revealed the eruption in the earth of a single stem. By the third panel, the movement was complete, including a peek at the root. The artist later shared with me that this piece has been a project he had been thinking about for 10 years and through a chance meeting become a reality. Mrs. Merrietta Fong shared with me that her husband Mr. Leo Fong President of Quinstar Technology Inc. located in Torrance met Mr. Enzo Aiello through a business associate while in Rome, Italy. After Merrietta saw Enzo’s work on his website, she wrote a short note to the artist via e-mail telling him, “Thank you for the beauty that you add to our world.” She told me, “He answered back, which was surprising to me,” As it worked out, the artist was coming to California, and during his visit they met for dinner and that was the beginning of a fast friendship. As the story goes, the Fongs were enjoying coffee with business associates one evening when Enzo shared some pictures of different projects he was doing. He then offered to do something for their home. Merrietta said, “This is my house–we are not a museum, or a gallery or anything important. It is just our home. And he said, ‘No, I think this would be appropriate.’” Mr. Enzo Aiello had a project he had begun 10 years prior and it seemed as if he had found a home for this special piece. Enzo told me, “Meeting Mrs. Fong gave me the opportunity to finish the project.” Mrs. Fong added, “We talked about various other possibilities, but when Enzo showed us the picture of the prototype and described the whole project, both Leo and I–we fell in love with it. We just had to see if we could do this somehow. This is a once in a lifetime event for us.” The threepanel mosaic piece, the “Getsemani” project, now resides in the Fong home and as Mrs. Enzo Aiello – Accessible, Everlasting ArtFong shared, “We were looking for something special for this spot [their living room wall] and we ended up with something more special than I could have ever dreamed of. ”Mr. Enzo Aiello was born on December 26, 1963 in Calabria, Italy and grew up in a very traditional Italian family. Growing up with his brother Pietro, who is exactly one year older to the day, and a younger brother was ideal in this southern Italian town by the sea. His father was a “carabinieri” (military corps with police duties). Enzo told me when he was a young boy his mother would give him a pencil and paper to quiet him down and he would lose himself with the creating. Enzo recalled, “I used to do portraits of the family with pastels and colored pencils. When I was 13 years old, I decided to go to Art High School. When I finished, I decided to go to the Fine Art College at the University and study painting.” He left his hometown for Rome to attend Art High School at the age of 13 and never looked back. “I finished college and began my thesis and I knew the Vatican was looking for somebody to work in the Basilica for a month just to explain art to the tourists. So in order to get the job, I had to go through an interview. I met with a priest who was choosing the candidates and he told me I was the first candidate to come from a Fine Arts College.” Enzo began working inside the Basilica and was there exactly three days when the priest who hired him asked him if he would be interested in learning about mosaic. “Yes, why not,” was Enzo’s reply. That agreement was to change his life. That very day, Enzo was escorted through the Vatican Garden and into the Vatican Mosaic Studio founded in 1727 to begin his apprenticeship. Mr. Aiello told me the Vatican wanted to create their own mosaics inside the church (St. Peter’s Basilica) to replace paintings that didn’t hold up to the weather, time and outside influences. The artisans discovered a way to make over 28,000 colors of opaque glass in the studio. Making their own glass would free them from being bound and beholding to the Venetian glassmakers for their supply of material. The artists were able to duplicate paintings perfectly with the small, colored stones. Italian painter, architect and writer Giorgio Vasari (1511 – 1574) said that mosaic art must imitate painting. To duplicate a painting using the mosaic technique is very difficult work only achieved by a master. The experts working in the Vatican Mosaic Studio did the copy work and were able to duplicate the great paintings with mosaic stone that would sustain the test of time. At the time Enzo worked in the studio, the group of eight “mosaicists” worked on new pieces, renovations and commissions. 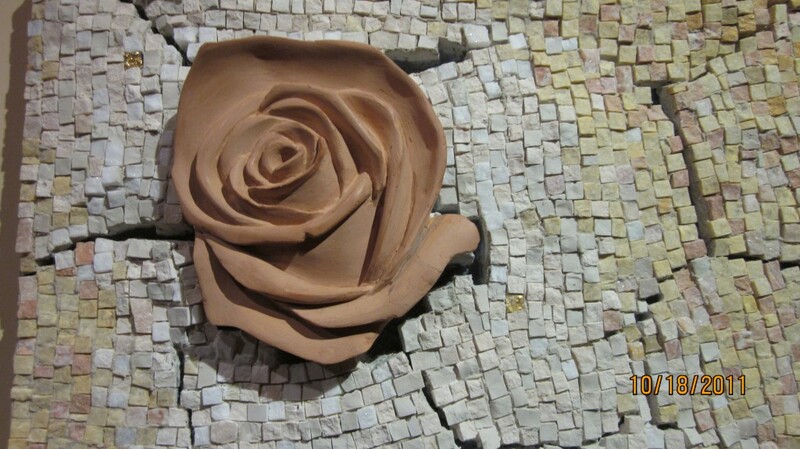 I asked Enzo what was the first piece he worked on and he said, “I started with a copy of a 12th Century piece–in the Santa Maria Maggiore [church]–a light use that is very important for the decorations because it gives the perspective, the flow and movement of the stones of the flower. That was my first piece.” Enzo worked in the Vatican Mosaic Studio for about two years and then moved on to the city of Ravenna, famous for its mosaic. Ravenna, once the capital of Rome in the 5thCentury, has numerous famous mosaics depicting religious themes. Enzo embraced the Byzantine technique and realized he was no longer an apprentice after his work in Rome at the Mosaic Studio.I asked Enzo what is his favorite piece or what project he would like to do next and he paused, looked toward the living room wall where the “Getsemani” project was hanging and said, “This is my best piece I have ever done. It is a very simple work, but unbelievably complicated. It is the result of 20 years experience.” Yes, Enzo this piece is breathtaking–literally. He went on to further explain, “This is marble mosaic. It is Roman mosaic because the Romans and Greeks used marble on their floors. But the Byzantine technique is the direct technique because you put the stone directly into the cement. The gold glass reflects in the Byzantine technique.” As we both looked at this piece of art, I was blown away keenly aware I was in the same room with this great artist. Mr. Enzo Aiello is one of the most accomplished mosaic artists anywhere, having done many restorative projects here in the United States and abroad.